"The President said he wanted this to be a year of bipartisan action. Well, it still can be. 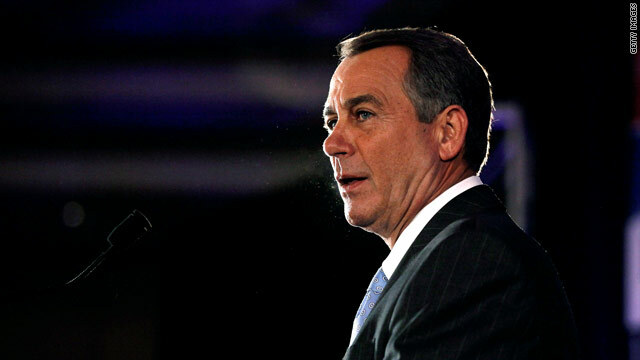 We just need to get his party’s leaders in the Senate to take up our jobs bills," Boehner said. Boehner also leveled some criticism at Obama. "For the last five years, we’ve had an administration in Washington that acts as if everything can be done from the top down," Boehner said, adding that "the people – not the government – shape our destiny." Obama, in a weekly address taped at the White House and released Saturday morning, also highlighted Americans taking an active role in the economy. He spoke about a small business owner who raised employee's wages and wrote to the President about how it made good business sense by helping to retain good workers. Obama signed an executive order to raise the minimum wage for federal workers in February, and he pushed Congress to do the same for all workers. "Republicans in Congress don’t support raising the minimum wage. Some even want to get rid of it entirely," Obama said in his weekly address. The President asked Americans to call their congressmen and tell them its "time to give the politics a rest for a while and do something to help working Americans." "Right now, there’s a bill that would boost America’s minimum wage to $10.10 an hour. That would lift wages for nearly 28 million Americans across the country," Obama said. Obama called on Republicans and Democrats to come together on an issue that he says three quarters of Americans support. "We know that our economy works best when it works for all of us – not just a fortunate few." - CNN's Cassie Spodak contributed to this report. A Texas family has won a $2.96 million fracking-pollution lawsuit that's believed to be the first jury verdict of its kind in the United States. Make that, "...raising minimum wage double the cost to SMBs..."
@Dawn Fotopulos: sorry but wages need to go up. Their will be costs but it wil be worth it in the long run. If you want to live in a capitalist system and have as few problems as possible, you can't leave half thhe country, most of whom work very hard, broke and in debt. The usurious monetary-system and inside-game that has become our economy allows for this. It's up to all of us to change this. Can't wait to see the orange Weeper of the House pass immigration reform in time for November 4. Those 10 million Republican voters who stayed home in 2012 will look like a drop in the bucket. Another day another Obumbles failure, shovel ready jobs anyone??? John and Mitch had 6 years to help the American people. They sat back and let lunatics control the conversation; people are hurting. Time for both of them to go! A picture of the man responsible for all of the troubles seen in this country in the last two years. And there are those who believe he's saving the nation. Never before have so many been held hostage, by so few. Get out and vote. Don't let 73% of the country to be held captive by the other 27%. If it gives people the ability to earn more and buy more things, wouldn't that help? All the republican so called jobs bills are based on the trickle down effect of tax reductions for the wealthy and keeping Tax credits and loopholes for corporates and also cutting corporate tax rates. Mmmm did not work before and wont now. Immigration reform adds to GDP and creates per CBO 1.6m jobs but we cant pass that because we don't trust Obama to abide by the law. Pathetic and a disgusting insult to a sitting president and one never before levied to any previous President. The real reason is that most of those people would vote democrat so cant have that bill. Fracking lawsuits its only just beginning one out fit has been illegally dumping radioactive filters from the Fracking wells. Watch this unregulated risky method of getting oil or gas and creating thousands of gallons of toxic waste result in many more law suits. Hey bo ner, you and your teaklans ran on JOBS, JOBS and JOBS in 2010. Who's dragging their feet and obstructing our government in every step and going as far as shutting it down? --minimum wage raise is long overdue, raise to 12/ an hour. It would appear that the one thing that is holding back wages as well as the Economy is the ACA. If you raise the minimum wage the threat of even more people losing their jobs or having their hours reduced to a 29 hour Work Week becomes reality. So far the country is moving forward in reverse at light speed. Passing a stupid law does one thing. Passing a law.